Who doesn't enjoy a day at the spa? 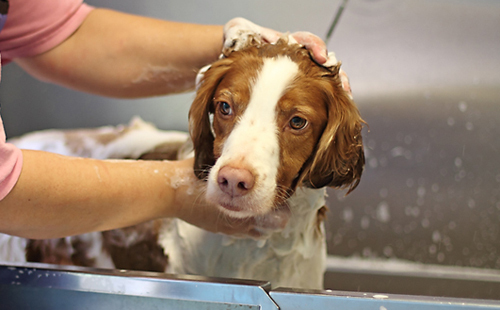 Treat your pet to a refreshing bath with one of our professional bathers. Your dogs appointment will include a Hydrosurge bath, drying, ear cleaning, nail trim and brush out. For the health of your pet, proof of vaccination will be required prior to acceptance for bathing. Vaccinations must be current for the year and include Rabies, Distemper, Parvo, and Bordetella. Bathing is available by appointment Monday - Saturday. Rates start at $25.00 per appointment, actual amount will be determined by breed and condition of coat.